An Amazingly Simple Concept to Cut Plastic Bag Usage, by Creating a Customised Rubber Stamp For Your Merchandise Paper Bags. It’s easy to save money and help save the planet by becoming environmentally-friendly and converting your plastic bag usage for your products into printed paper bags. We all care about the planet we live on. 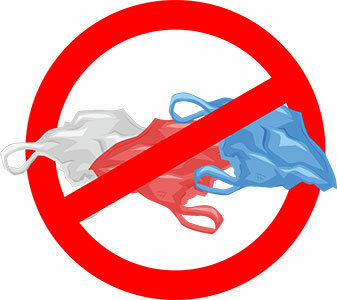 Most of us know by now the absolutely devastating effect single use plastic bags are having on the environment. The four most prolific offenders in the area of plastic pollution are; Plastic cups, plastic bags, plastic bottles and plastic straws. Neither you nor we at Stamps Plus can universally solve all of the plastic pollution. By changing from plastic bags to paper bags for your products or merchandise, you can indeed make a huge and measurable impact on the environment. This will make you feel better for doing the right thing, help you meet compliance for government accreditation and reduce your packaging expenses. You could even attract more business as more and more environmentally- savvy folk begin to reward retailers and product suppliers for being environmentally astute. Indeed a great thing and a ‘win-win’ for all! Steps and processes to get you plastic bag free. When confronted with the prospect of converting from printed plastic bags to printed paper bags, the process can be exceptionally daunting. Typically, one immediately starts to look for plain paper bag suppliers as a point of departure. Then, the process of having your logo and branding transferred onto your paper bags through printers makes the nightmare worse! Offset printers need to make special dies and other printer componentry to process this kind of printing and before you know it, the costs are exceptionally high. Or you will be faced with having to have tens of thousands at a time printed by one of our eastern trading partners and the chances of getting things wrong like branding, together with very long waiting periods makes this unattractive as an option. What if you had your own printing machine and could solve all of the above problems and achieve the same at astonishingly low entry costs? Well, you can actually! If your brand and/or logo size can be restricted to 125mm x 175mm or less, we’re half there to your solution. Self-inking stamp housings has the largest text plate size set at 116mm x 70mm. If your brand/ logo needs to be larger than that, then we can craft a traditional styled wooden stamp. The largest of the required stamp pads for this sort of application can accommodate a traditional styled wooden stamp measuring up to 125mm x 175mm. Some more resources and tips for your journey in getting plastic bag free. How to make your own paper bags. Consider using recycled boxes for your customers. Encourage your customers to bring in their own canvas bags where possible. 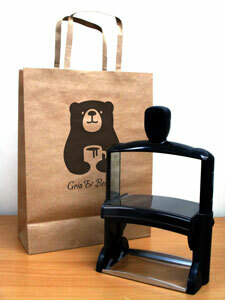 Steps and processes to get your paper bag stamp printed. Decide whether you would like to have your own rubber stamp and print the bags yourself, or whether you would prefer to order stamp printed bags from us at Stamps Plus. If you wish to have your own rubber stamp, send your artwork and instructions to us at Stamps Plus. We will size and offer recommendations. See our range of Paper Bag Stamps here. If you wish to simply order stamp printed bags, let us have your artwork and we will give you pricing options. It does not have to be difficult to move from single use plastic bags to printed paper bags for your merchandise. If you follow our steps and recommendations, you too could be saving money, help save the planet and attract environmentally savvy customers.